I would buy this product. Grills are amazing for cooking on. I would use it to cook food on it in the summer time. I would use it for cookouts, family get togethers. Just about anything really. Great Grill for the money! I love this grill. Basic...simple...easy to handle. I have maintained this grill and have had it for 2 years. The grill is quite big, but may be a little too big for many. Because of that, it is quite tough to store. 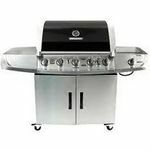 A smaller grill with those features would have ideal and attract many more people towards it. Performance It heats up fast and cooks food evenly. You can cook many foods together due to its massive size. Versatility It is ideal for making steaks, but smaller foods like vegetables often gets lost in the grates. Ease of Clean normally, it is easy to clean, but if some food stuck in the grates, it becomes little tough to recover it. Durability I have this grill with me for sometime now, it seems pretty durable. Hopefully it should last for many years. Design the design is quite attractive, but it should look more prettier if the size have been little smaller. 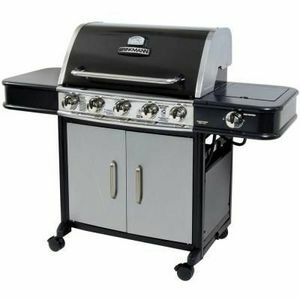 A big grill with big possibilities! This grill is BIG, but possibly a little TOO big. We bought it for the features like the sear burner and side burner, but it's a little cumbersome to store because it's so large. The same features on a smaller scale might be a good idea. Performance The grill heats up quickly and evenly. The food seems to cook thoroughly but does not immediately burn like with some grills. Versatility The sear burner makes this grill great for steaks, but some smaller foods like vegetables can get lost in the grates. Ease of Use The grill is very easy to set up and to light. The tempature gauge seems pretty accurate. Ease of Cleaning Cleaning the grates is pretty easy, but getting anything that falls in requires dismantling the grill some. Durability I haven't really had the grill long enough to know how durable it is with being outside, but it seems pretty sturdy. It doesn't wobble or seem tippy at all. 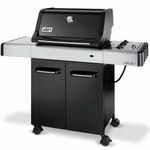 Design The grill looks very nice and has nice features like the side burner and sear burner. I liked the gas grill initially when we first got it. It took a while to set up initially, probably an hour. It's an easy first time grill for ones who aren't super advanced with grills and whatnot. I thought it was pretty basic and easy to work even for me a woman, with no real skills grilling. Performance I think the grill works overall pretty well, although like basically all grills there are a couple spots that are cooler and may affect the cooking of the meat a little. It just took some time to figure out where exactly was the best spot to place the meats so that they would be cooked evenly. Versatility It works pretty well for serving a small family conveniently. I would say we have been able to serve around four or five people at a time which makes it pretty ideal for quaint little family gatherings but probably not for big party bashes or large gatherings. Ease of Cleaning Everything must be washed before the grill gets too cool or it becomes very difficult to scrape the remainders off. Solid grill, but occassionally will not burn hot enough. We have had a number of grills in the past the this one is the best by far. 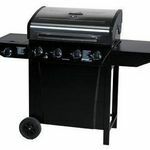 Performance This grill heats up quickly and keeps even temperatures. Versatility This grill is easy to transport to picnics and camping. It also comes in handy in case we need to use when the electricity is out in our area. Ease of Use We found that this grill is extremely easy to use and helps us create excellent food for our family. 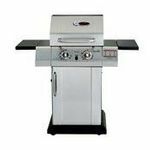 We have used it to cook hot dogs, hamburgers as well as steaks and smoked turkey. Ease of Cleaning The grill cleans easily with paper towels and water. Never a problem with left overs stuck on the grates. 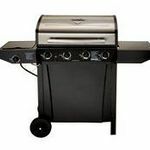 Durability The grill is a quality piece of equipment and has held up well with continued use. The exterior has not shown any signs of rust as others have in the past. Design It is convient and easy to use weather you are making hot dogs or steaks It can keep items warm as well as cook with the burner design. The side burner makes items like beans easy to heat or cook. Easy to use reliable grill. Solid grill. Gets the job done. Not top of the line but it works great. I use mine 2 or 3 times a week for a couple years now. Ease of Use The only problem I ever had was with the electric starter. They wear out and ya end up using a grill lighter. Ease of Cleaning Easy to take apart and clean every part of the grill. Durability Two years old and the one I had before lasted for almost 5 years in the weather.